As an artist, I try to honor the muse that guides me. Over time, I’ve gotten better at paying attention and following its lead. Years before I was a grandmother, an idea took residence in my heart. I could clearly see a blue-eyed, blond haired baby, around six months old, being hugged by his mama. Around them were written the words, “Snuggle bunny, you’re my honey.” I neatly folded and tucked this concept away to be brought to life when I had a grandchild. I became a grandmother for the first time in the spring of 2014. Shortly after my son, Brian, and his wife, Pam, announced they were having a boy, I began my search for the perfect bunny outfit for him to wear in my “Snuggle Bunny” illustration. One thing was certain, I did not want my grandson wearing a costume in which he could be mistaken for a girl. 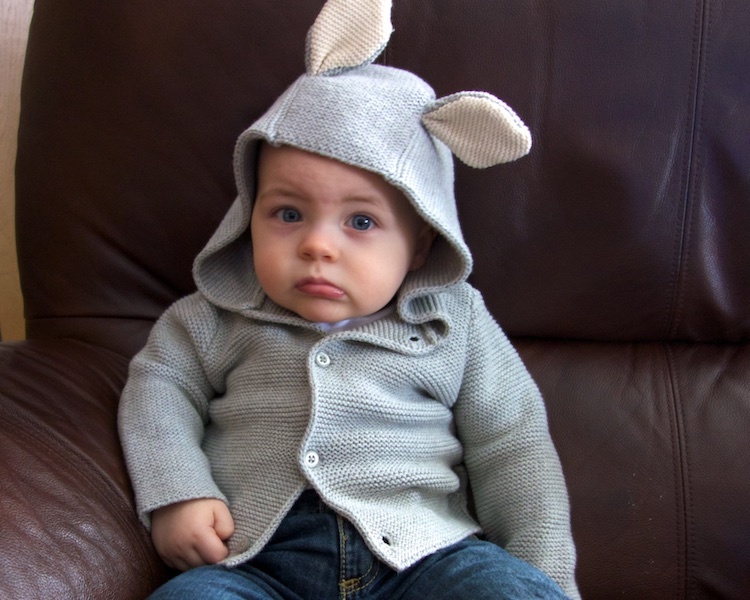 After combing the internet, I came across a darling grey, hooded sweater with bunny ears. Perfect. I was all set to photograph my grandbaby wearing it when the time was right. Now all I had to do was be patient and let the rest of the pieces of the puzzle fall into place. 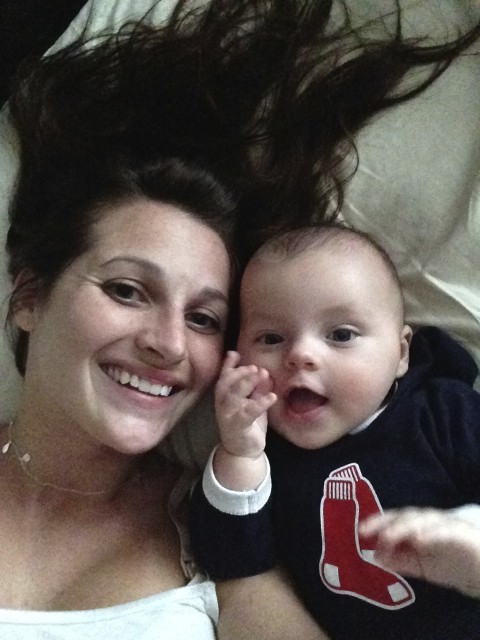 When Cam was around three months old, Pam sent me the most endearing selfie she had taken of them together. In it there was something so enchanting about the look of wonder on my grandchild’s face. They reminded me of sea creatures looking through a porthole. Because Pam is enamored with the ocean, I had envisioned painting a watercolor of her and Cam as mermaids, but not until he was a toddler. Seeing that selfie changed all of that. Bam, my creative juices were flowing now! I began working on a mermaid portrait based on that image. It would be the perfect Christmas present for their little family. Meanwhile, on November 17th, our oldest son, Rob, and his wife, Emily, gave birth to our second grandchild, Logan James. My husband and I were overwhelmed with joy. I couldn’t wait to capture our newest grandchild’s essence in a painting. I was certain the perfect scenario to place him in would be revealed after I got to know him. Humming in the background, was my quest to get the perfect picture of Cameron in the rabbit sweater. He was already past the age I had envisioned for the baby in my bunny illustration. One day in December, I asked his mom to bring the bunny sweater over with Cameron, so I could photograph him in it. 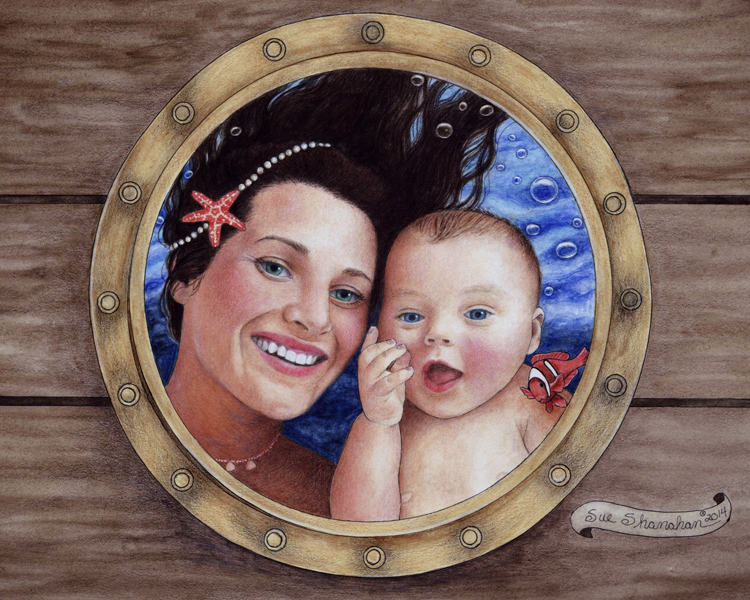 I had decided to move forward without having her in the illustration, as she had already been included in the mermaid portrait with her little guy. At one point, I thought that maybe Logan was the baby I’d seen in my mind’s eye, but quickly dismissed the thought. No, I had bought the sweater for Cam before he was even born. I felt bound to my original plan. After Cameron arrived, I began trying to make him smile for the camera, but he would have none of it. He sat stone-faced as I tried to make him laugh. I gave up. Letting go of my inflexibility opened the door for Logan to come through. I came to the realization that he was the baby I had envisioned all along. With his blue eyes, blond hair and chubbiness, he was the snuggle bunny I had visualized! Cameron being very unsmiley indeed. I immediately began making plans to photograph Logan with his mom when he was six months old. I pictured the background of the painting being a wash of yellow— sunny like Logan and Emily. I would ask his mother to wear blue to match Logan’s eyes. Relaxing my grip allowed for the realization that the sweater had to go too. Instead, I found the softest, plushest, bunny-eared bath blanket to wrap Logan’s chubbiness in. I began to “see” him with a carrot rattle in his hand. I googled “carrot rattles” and to my surprise, I easily found one. Finally getting the concept on paper was a full-circle moment for me. The image was a gift that had been given to me to pass on to my son and his family. As I type this, “Snuggle Bunny” is getting matted and framed. It will be wrapped and placed under our tree to be opened by Rob and Emily on Christmas morning. Shhhhhh. The two photos I taped together to base my portrait on. I continue to be in awe of the creative process. Bringing forth art works best when I don’t try to force it, but get quiet and listen. The muse always makes its wishes known. Step by step, following its directions never disappoints. Creating a masterpiece from thin air is a simple process. It’s all in the allowing. Isn’t it wonderful that God gives us second chances with grandchildren!! So much love, Sue. 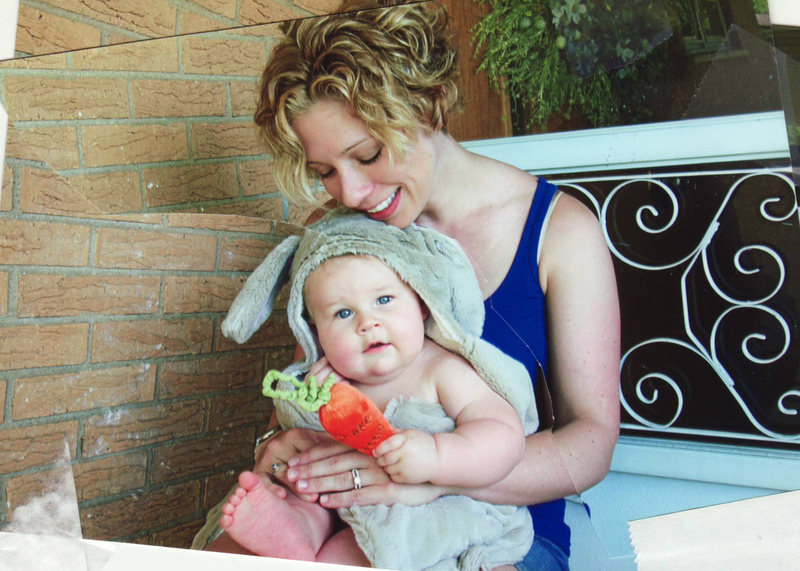 From getting the bunny outfits, the carrot rattles, to letting the little one make the picture – I see only love of a grandma. You so know my heart!